Why are not all voltages displayed in the Results Navigator? Even with the internal forces not all options are shown. This depends on the choice of model type. In this case a flat system was chosen. Thus, only for this level, the relevant results are displayed because they are reduced because of the limited coordinates and degrees of freedom. 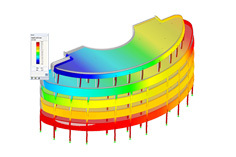 If, on the other hand, a 3D system is selected as the model type, all stresses and internal forces are displayed.